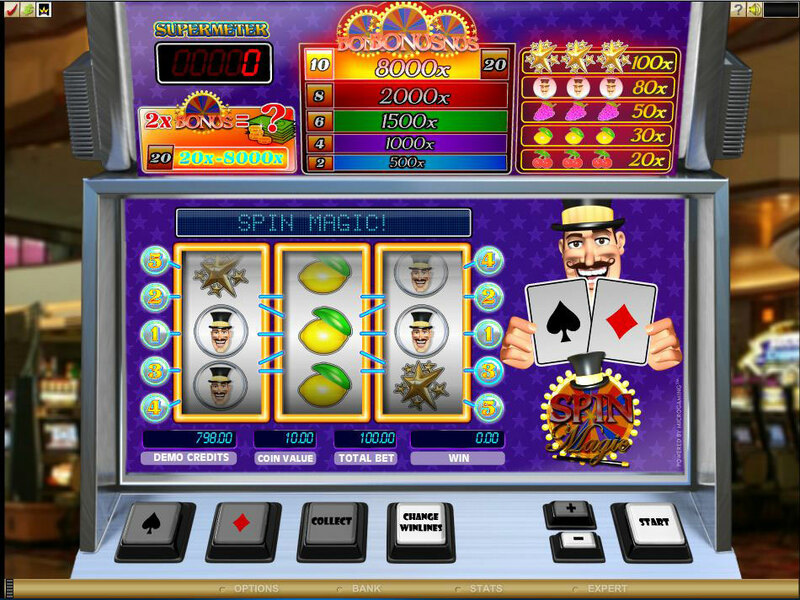 Spin Magic takes the form of a classic slot machine, being designed to look like it’s a game that is on the floor of a Las Vegas casino. Microgaming did add a very special feature to the game though, a bonus game that can bring you prizes through a wheel of fortune. The theme is magic related, with the magician being visible nearby and showing you two cards. There is nothing truly special about Spin Magic, but that doesn’t make it any less attractive for a fan of the classic genre. Spin Magic is an interesting title, with a bonus game and with stacked symbols contributing to that impression, both being offered on 3 reels with 5 lines. There is a top payout of $80,000 which can be won as well. 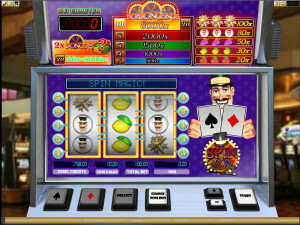 The slot’s only feature is a bonus game, which can be triggered with the help of its own Bonus icons. The Wheel of Fortune bonus game can be triggered by the presence of two Bonus symbols while in Supermeter mode. The Supermeter mode requires that you use 20 coins, so it’s more expensive than the base game. It also allows you to get into the bonus game if you’re lucky, two symbols with the Wheel being needed to get to that stage. 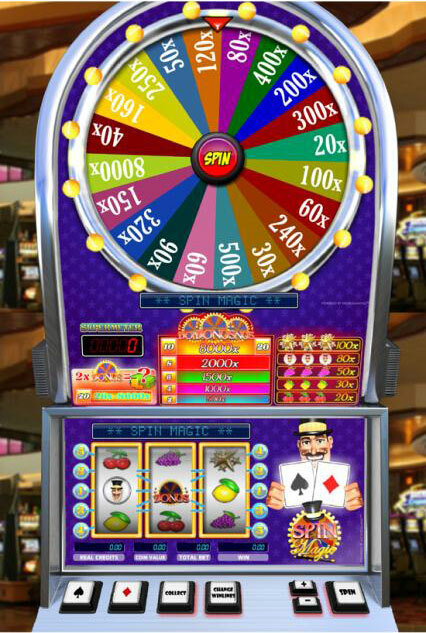 The wheel is situated at the top of the screen, and from there it will spin and will decide what kind of prize you can take home. The value of the prize goes from 20x to 8,000x, so it can be just another boring bonus or it can be an exciting opportunity, depending on your luck. Another thing that is important here is the presence of stacked symbols. It’s unusual for a classic slot machine, and it can mean more payouts at the same time, but it can also mean more time before you actually get a prize. The game uses 1 to 10 coins normally, with the denomination varying between $0.10 and $10. Supermeter mode can take this wager up to 20 coins, making this one of the more expensive classic slots you will find anywhere. The base game doesn’t give you that much, but with the bonus game helping out you can take home up to 8,000x, which in this case means $80,000. Spin Magic looks like it’s a slot machine that is placed on a casino floor. You get the feeling that you’re in Las Vegas, playing the slots. 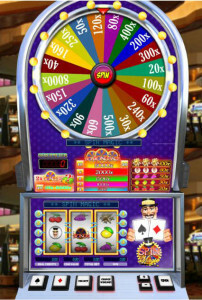 The shape of the slot is that of a classic one, made out of metal and with the bonus game at the top, the paytable underneath, the reels in the middle and the betting buttons at the bottom. The symbols are themed for the most part, which I enjoyed seeing. Symbols: Bonus Wheel (8,000x), Stars (100x), Magician (80x), Grapes (50x), Lemon (30x) and Cherries (20x). I certainly enjoyed giving it a try, and I think you will love it as well. The prizes are good, but it can be a tad expensive to play at its maximum potential. This Spin Magic slot is offered by all online casinos with Microgaming software, playable either in practice or in real money mode.